After using Mac for 10+ years, I’ll start this year with iPad Pro 11″ as my only work device. Here’s why. I love working smarter instead of harder. And to discover what those smarter things are, I seek to do less. But doing less is hard when my regular computer is so incredibly powerful. I can easily do a million things I really shouldn’t, just because I’m fast. Things that aren’t my responsbility to begin with. From a focus perspective, the smaller screen is actually a benefit. It’s a constraint that forces me to focus on my own intentions, and helps me stay connected to my inner self throughout the day. I think it also helps battle technology addiction. It’s easier to unplug when I’m not involved in everything. A smaller screen doesn’t let me have Slack visible all day. Very liberating. I’ve worked remotely for 12+ years. I love it. But sometimes I miss brainstorming together in a room. In particular, I miss the whiteboard. Enter Scribble, a fantastic little iPad app. 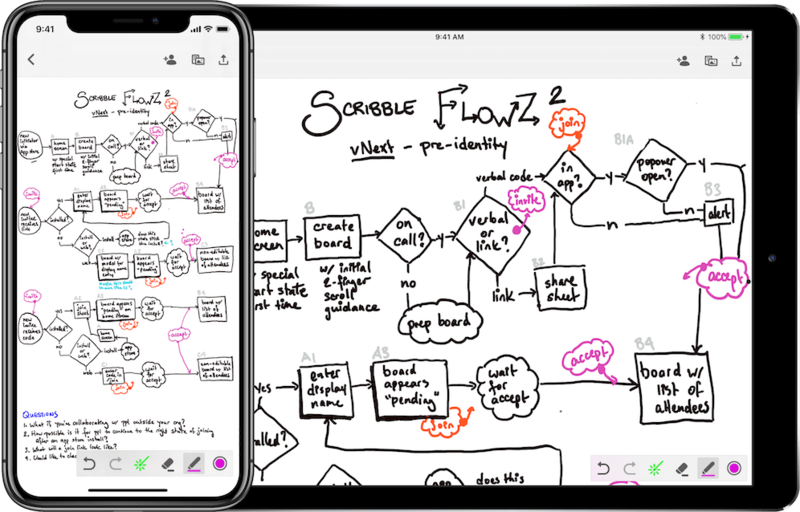 It’s a collaborative whiteboard that works across desktop and mobile. It supports the Apple pencil, has an infinitely large drawing surface and makes it very easy to invite others to join in. Everyone is looking at the same thing because Scribble is syncing the scroll position:It’s pretty brilliant for remote meetings. You should try it out. The hardware is better: It’s got internet connectivity, a touch screen, a pencil for drawing and quickly expressing ideas, a much better camera, it’s lighter and smaller, has a GPS, accelerometer, etc, etc. Did I mention internet built-in?! I’m like: why does my laptop in 2019 not have cellular? Or a touch screen? Bluetooth seems better, too. The iPad feels more mobile than my Mac. If I want to go to another room in the middle of a video call, I just put the iPad in my bag and move, without dropping out. Pretty sweet. The software is better: This one is harder to argue for, because not everything is better here. But much of it is. Thanks to the iPhone ecosystem, there are really strong native apps for a ton of things. Email, calendar, note taking, music, messaging & social media, banking are all far better on iOS than on the Mac/web. Some business apps are still much weaker compared to their web versions. But the features that do exist are usually way better designed and executed as native apps (like Google’s Calendar, Drive, Meet, etc, and ClubHouse, Intercom, Adobe Scan, and many more). The iPad almost works like a large iPhone anyway. It handles calling, iMessage and even SMS, it does FaceTime, 2-factor auth, etc. No more “wait, let me pull up my iPhone and switch over my AirPods and then I’ll call you back“. Leaving the iPhone at home cuts out another access to distraction — I really shouldn’t be looking at Reddit while going out for lunch anyway! I’m excited and this is promising, but I’m sure there’ll be drawbacks, hiccups and annoyances. I’ll share another post in 3 months to see what worked and what didn’t. Hat tip to @nevyn for being an inspiring early adopter of new tech.